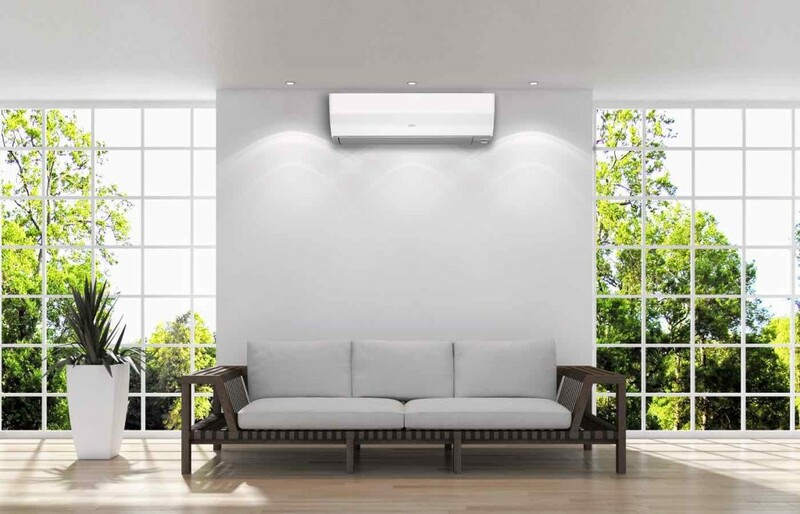 Ductless heat pumps offer more flexibility than many other heating systems because they allow you to heat or cool room by room instead of an entire home. Conventional heating systems deliver heat to your home through a series of ducts. 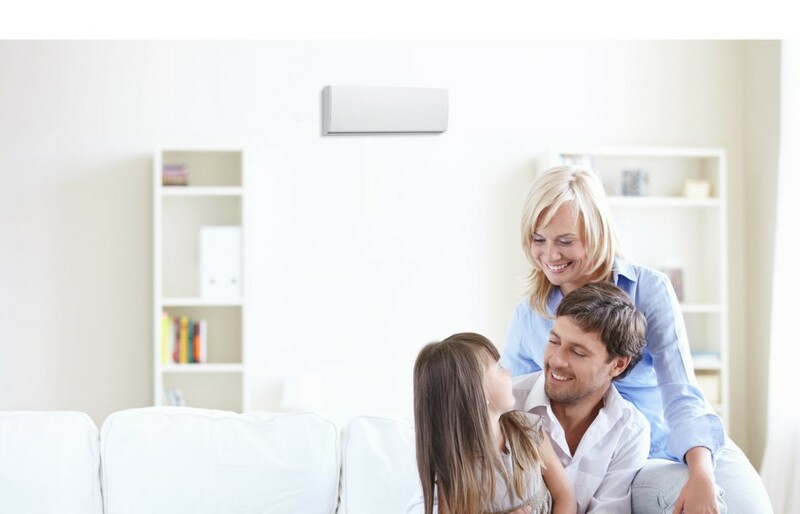 With a ductless heat pump system you can choose to heat or cool individual zones, so that you only have to use energy to adjust the temperature in the rooms that you’re actually using, and that makes a lot of sense. 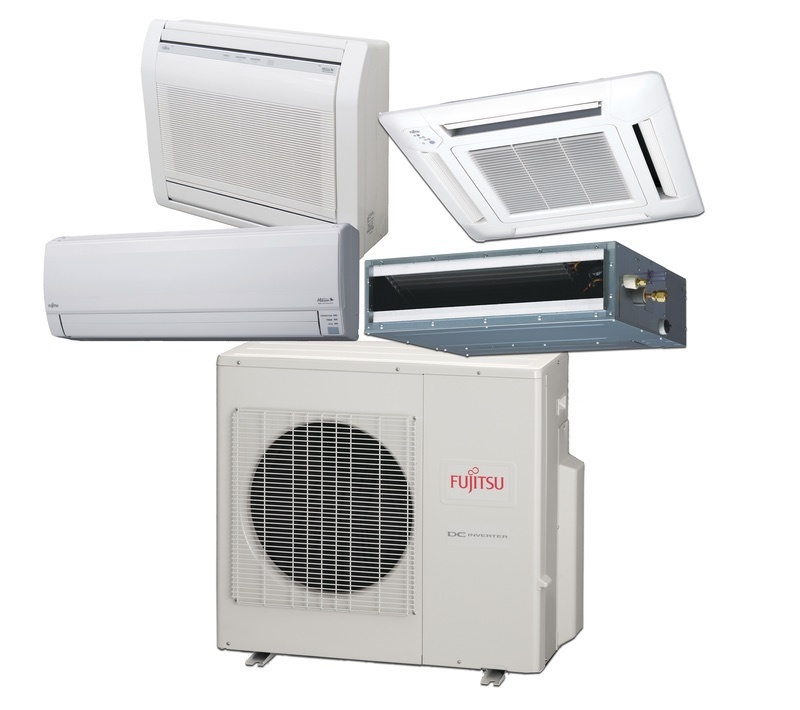 Where can you install a ductless heat pump? Almost anywhere! They’re designed to compliment a variety of home decors and are easy to install. Ductless heat pumps can be installed on a wall, ceiling, or as a free standing unit. This makes them an excellent option if you are renovating your home or just updating a room. The best part? You only have to pay for the energy you use. 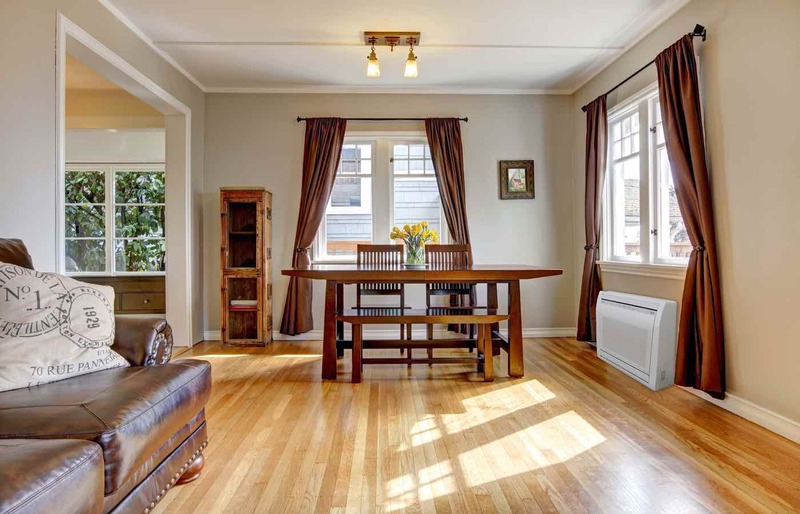 Does your home have drafty areas that your family avoids? A ductless heat pump can make any or all of the rooms in your home more comfortable. 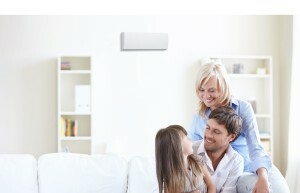 Wall Mount: With a wall mounted ductless heat pump you can heat and cool your home with the same unit. As the name implies, there’s no ducting to install. They offer individual temperature control with greater energy efficiency than electric baseboards and you can install as few or as many as your home requires. 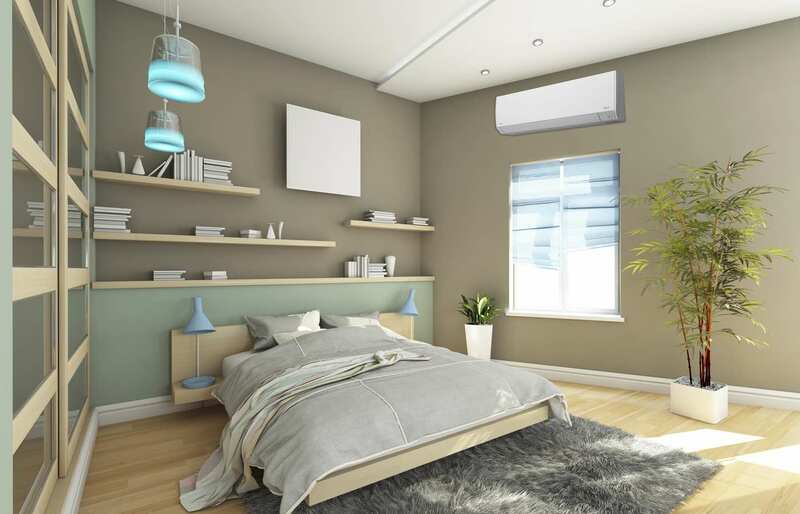 Quiet and discreet, ductless heat pumps can heat your rooms without using up floor space. So go ahead and rearrange the furniture. Floor Mount: If you prefer to feel the warmth directly (and many do) you can also install a floor mounted ductless heat pump. Like conventional baseboards, these are typically installed along an outside wall. Each unity has its own temperature control to quietly heat or cool your room giving you efficient climate control at your finger tips room by room. Ask our staff to help you choose the best model and size to meet your needs. 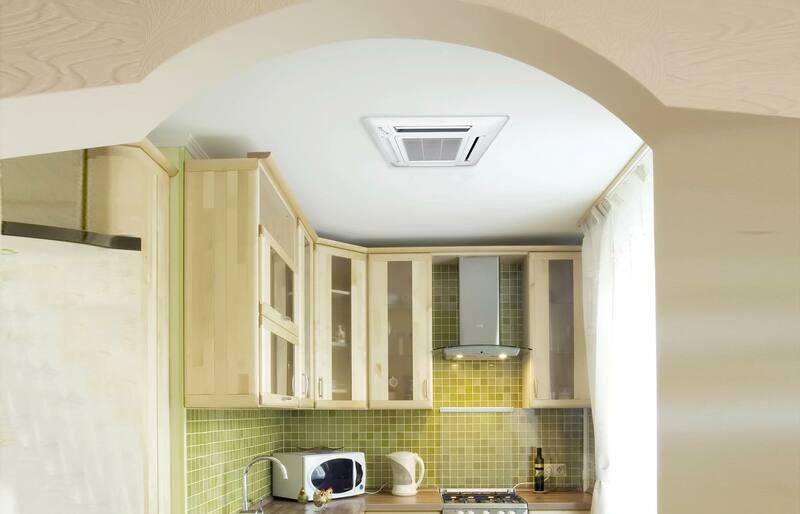 Slim Duct: Ductless heat pumps can also be installed in the ceiling of your room. The recessed slim duct option is a perfect choice for larger rooms that are hard to keep at a consistent temperature. You can experience year round comfort by connecting 2-8 indoor units to one outdoor unit. Some people like it warmer or cooler than others, so each room can be assigned its own zone so you can control the temperature to suit your needs. Cassette: The cassette option of a ductless heat pump offers a four-way distribution of warmth or cooling from the top down. Like the other installation options, you can control the temperature with this ceiling mounted unit by zone so you only heat the room you want, not the ducts or attic space. Because all of the compressors and motors are outdoors, you won’t hear the disruptive sounds of things “kicking in and cutting out” meaning you have a more peaceful indoor environment. 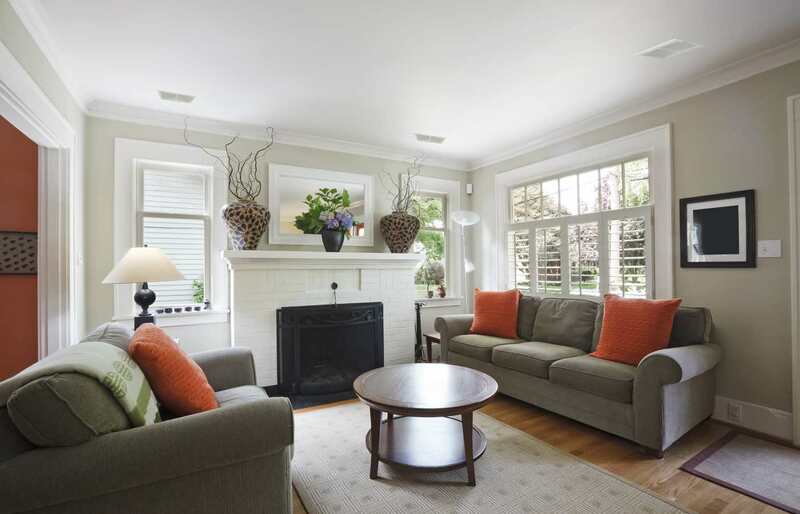 Do you have a warm spot in your home? Our mini-splits can provide extra cooling capacity for those hard to cool areas. Commercially, their small size makes them ideal for small offices, providing individual temperature control. *Savings may vary based on model selected, hours of operation and geographical location. Example given based on 26-SEER system versus 13-SEER system. As much as half of the energy used in your home goes to heating and cooling. So making smart decisions about a home’s HVAC system can have a big effect on utility bills — and comfort. With ratings as high as 33.0-SEER (Seasonal Energy Efficiency Ratio), systems 9RLS3, 12RLS3 and 15RLS3 are among the highest rated efficiency equipment available anywhere! Halcyon system knows how to save you money even when you forget. If you leave the room without turning the unit off, ESP knows that you left and 20 minutes later, the set temperature is increased by 4°F when cooling and reduced by 8°F when heating. When you come back to the room, it returns to previous operating mode. This prevents wasteful operation to save energy without you having to think about it. Programmable Remote: Weekly timer can be easily set by wireless remote controller; ON, OFF can be set up to 4 times in one day and up to 28 times in one week. For other modes, program timer and sleep timer can also be selected by pushing a single button. Powerful Heating: Heating capacity at low outdoor temperatures was improved by adopting a large heat exchanger and a high capacity compressor. Rated heating capacity is maintained up to 20°F. This new model can operate down to -5°F. World Class Performance: Since mini splits have little to no ducting, they forego those energy losses typically associated central forced-air systems. Duct losses can easily account for more than 30% of energy consumption, especially if the ducts are not sealed tight or are in an unconditioned space such as an attic or crawlspace. With ratings as high as 33.0-SEER (Seasonal Energy Efficiency Ratio), systems 9RLS3, 12RLS3 and 15RLS3 are among the highest rated efficiency equipment available anywhere! 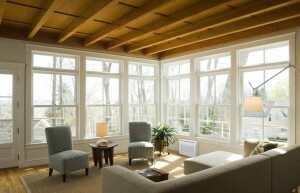 Quiet Operation: Ductless heat pumps and air conditioners are comprised of an indoor and outdoor unit. You get a peaceful inside environment because components like compressors and motors outdoors are installed outside. Inverter Technology: Through advanced technology, Inverter air conditioners are more economical to operate and quieter to run than conventional units. They can handle greater extremes in temperature, are smoother and more stable in operation, and reach the desired temperature more quickly than conventional air conditioners. The Inverter component allows the outdoor unit to vary its speed and output to match the required capacity of the indoor unit. Thus, the Inverter model can achieve 30% more operating efficiency than conventional models and is much less expensive to run. *Auto Changeover (Heating to Cooling or Vice Versa) automatically alternates between heating or cooling if the room temperature falls 4°F below the set temperature when cooling or rises 4°F above set temperature when heating. Auto changeover is not designed to provide rapid changes between heating and cooling operation or simultaneous heating and cooling. Stylish, slim and elegant, these popular wall mounted units are designed for single rooms. Indoor units have a clean, aesthetic design and are small but mighty and shorter in length than competing units, helping them blend into any room. 9RLFW1 and 12RLFW1 are ENERGY STAR qualified heat pumps, meaning they save you money on your utility bill and provide both heating and cooling. Ultra compact yet efficient, System 30RLX provides maximum comfort in 30% less space while saving you money. Additionally, this system provides low ambient operation rated down to 0-degrees right out of the box without modification. Inverter Technology: Through advanced technology, Inverter air conditioners are more economical to operate and quieter to run than conventional units. They are smoother and more stable in operation, and reach the desired temperature more quickly than conventional air conditioners. The Inverter component allows the outdoor unit to vary its speed and output to match the required capacity of the indoor unit. Thus, the Inverter model can achieve 30% more operating efficiency than conventional models and therefore, is much less expensive to run. ENERGY STAR® Qualified (Excludes System 30RLX): Since mini splits have little to no ducting, they forego those energy losses typically associated central forced-air systems. Duct losses can easily account for more than 30% of energy consumption, especially if the ducts are not sealed tight or in an unconditioned space such as an attic or crawlspace. With ratings as high as 23.0-SEER (Seasonal Energy Efficiency Ratio), these systems are among the highest rated efficiency equipment available anywhere! Quiet Operation: Wall mounted systems include an extra quiet fan speed (“Quiet Mode”) to make sure that you are not disturbed. Wireless Remote Controller: Comfort control is at your fingertips with the standard wireless remote controller. Washable Panel Filter: The removable and washable panel filter is an effective air cleanser, removing mold & dust from the environment. Cleaning of the indoor unit itself is simple due to the design and shape of the casing. Clean Air: These heat pumps feature both an Apple-Catechin Filter and an Ion Deodorizing Filter. The Apple-Catechin Filter absorbs dust, mold spores and microorganisms by static electricity. Growth is inhibited and deactivated by the polyphenol ingredient extracted from apples. The Ion Deodorizing Filter deodorizes by powerfully decomposing absorbed odors using the oxidizing and reducing effects of ions generated by the ultra-fine particle ceramic. Smart System – Auto Mode: When the system is initially turned on, the fan speed is HIGH to reach the set temperature as quickly as possible. The fan speed will automatically adjust downward as the room begins to reach the set temperature. Humidity Control: This system features Dry Mode, which helps to control humidity levels, even when cooling may not be needed. 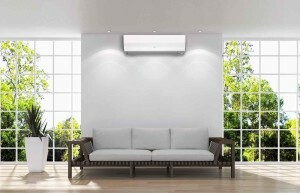 Stylish, slim and elegant, these wall mounted ductless heat pumps are designed for single rooms. Ideal for spaces requiring additional capacity but are limited on space. Fujitsu systems are great for solving various application-specific problems. Businesses and institutions such as schools, churches, nursing homes and hospitals, commercial office buildings, strip malls, motels and restaurants, apartments and condos, and even residences commonly use these systems. With more efficient zone control, “ductless mini-splits” are perfect for renovations, restorations, conversions, and add-ons. Since mini splits have little to no ducting, they forego those energy losses typically associated central forced-air systems. Duct losses can easily account for more than 30% of energy consumption, especially if the ducts are not sealed tight or in an unconditioned space such as an attic or crawlspace. With a rating of 19.0-SEER (Seasonal Energy Efficiency Ratio), these systems are among the highest rated efficiency equipment available anywhere! Smart System: Auto Mode: When the system is initially turned on, the fan speed is HIGH to reach the set temperature as quickly as possible. The fan speed will automatically adjust downward as the room begins to reach the set temperature.